F.Hinds has increased operating profit by over 50% in the year ended March 26 2017. The family-owned jeweller, which has around 115 stores throughout the UK, reported a small increase in sales from £60.05 million to £61.44 million. Operating profit rocketed from £2.03 million to £3.08 million, a rise of 51.5%. Company secretary Stephen Cornwall says that better stock management based on improved information technology is helping the business. “Stock holdings slightly reduced over the course of the year, despite the company having a greater number of stores,” Mr Corwall explains in a business review of the year filed with the accounts at Companies House. “Buyers took advantage of of greater transparency of stock lines on new IT platforms to order more efficiently and improve stock turnover,” he adds. 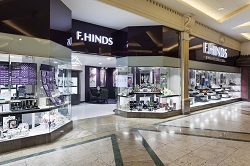 F.Hinds does not disclose the breakdown between watches and jewellery sales in its company accounts, but jewellery plays a more significant part in its business than comparable retailers. That may have cushioned the company from the worst of the downturn in sales of watches priced at under £500, which make up the vast majority of its portfolio. Best-selling lines include Citizen, Skagen, Rotary and Accurist. F.Hinds is investing in improving its store environment across the country. The company revealed a new flagship design at Manchester’s Trafford Centre during the year, which included a new colour scheme for its branding. The company says it is frustrated that it cannot open more town centre stores because the costs are too high to make them as profitable as shopping centre units. “Business rates based on historical high rents continue to be detrimental to many town centres,” says Mr Cornwall. “If the level of business rates reflected the true current level of rents in certain towns, then the company would undoubtedly have been able to open more shops and create more employment,” he adds. This is a long term issue that has frustrated F.Hinds for many years. “It is now ten years and 18 new units since the company has opened a store that is not in a shopping centre, which is worrying for the future health of our high streets,” Mr Cornwall says.